Since Ken and Donna live about 75 yards from the gate in Vulture Street that happens to be next to the members which happens to be where we get our seats every year, it seemed civilised to stay at their place overnight. Besides, Ken makes a nice cup of coffee. The day dawned with clear blue skies, but by the early start, it was cloudy again. Jiminy and the White Wiggle resumed where they'd left on the penultimate over the day before. Every now and then one of them'd accidentally snick one and feel obliged to change ends. The poor bugger who was twelfth man was running out to the Wiggle about every fifteen seconds, he's going to have to get a mascara that doesn't run so often or no-one'll be twelfth man. I think there were about three runs scored in the first session, but a bunch of blokes (maybe 50 or so) in yellow shirts and sombreros had somehow managed to circumvent the fun police and were sitting together en mass. To counter this the riot police (No I'm not kidding) were assembling in the concourse behind. While sombreros haven't officially been banned, I'm sure there must be something about them in the fine print, and in any case, they are tantamount to a racial taunt and anyone wearing one in future will be arrested I'm sure. The kids in the next bay who do the kanga cricket thing were getting a bit testy, so started a wave-like thing. Clearly it wasn't a Mexican Wave, because they would have been arrested, and that would have ruined the half time entertainment. I suspected they'd sussed it, and pulled a Birkdale Wave out of the hat to get around the rules. It didn't work, they were all turfed out after lunch. I went for a walk to see what life was like among the yellow shirts, and to count the Boonie Mo's, but I only saw one and it was Nikko'd on, so it was probably left over from last year. By lunch, Mitchell Johnson (Mitch to his mates) had been interviewed about seven hundred times, and his girlfriend wasn't looking any less attractive. He'd done no wrong at that point, not having actually been on to the paddock, so was really earning his place as the darling of the press. Luckily for me I'd just come back from England, 'cause when I went down to buy a pie and it was $6.50 I could do a quick calculation and say to myself, "Not bad, that's not even three quid". Sometime during the day, Jiminy seemed to get a bit bored with just standing there watching the Wiggle talking to the twelfth man, because he sort of just started to play like he was fairdinkum. The Wiggle thought he'd lose his spot if he didn't play the same game, so he arranged for the 12th man to come out every second over for a bit, and started actually playing cricket for a bit too. Not surprisingly the scoreboard blokes had to wake up, and before you could say "Mr Cricket" they'd both made hundreds. On the Teev they said the pitch had dried out and that made it easier, but I'm not so sure. I had my money on Jiminy to be 180 not out, so was sad when he got tired and left. When Krusty came in, we were getting worried that he'd had the pads on for so long that his leg muscles'd atrophy, but he wandered on and made the other two look like dills. 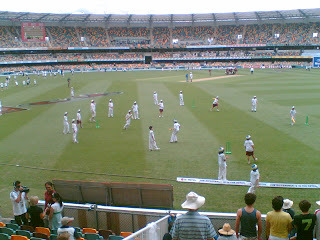 Krusty got his 50 the next over, but by then Punter was getting tired of hanging round indoors and called the boys in. This is where it got really interesting, 'cause the Wiggle unselfishly wanted his 150 by hook or by crook. The twelfth man came on every ball for the last three overs, in which the Wiggle failed to score the six runs he needed, before Punter finally put his foot down. I went for another walk to see how things were going down in yellow shirt territory, and their stock of beach balls seemed to be diminishing rapidly, but the floor was STICKY down there and I didn't like it, so I returned to my seat. That's when the best bit happened. I was sitting very near Mitch's dad, and when he walked on to the paddock in that fresh green cap, the old man just about burst. Then when he was handed the ball for that first time, the old man's grin just about joined up at the back of his head. It was truly wonderful. Made me think of my old man, and how the biggest disappointment in his life was that I couldn't play cricket to save myself. It would have been special to have made him grin just like that. I told you I would comment on your blog! A fair summary apart from the main highlight being a trip to the shop over the road for a paddle pop. Now I feel all warm and cuddled! I didn't want to mention the paddlepop, because I bought a Magnum and it'd seem like I was bragging! Cricket now over - the bully boys win again!